Last Saturday the FBLA (Food Bloggers Los Angeles) group got together to eat, talk and discuss. It is so much fun to be with this group and just talk about food blogging, and nobody thinks you’re boring or crazy. Everyone brought food for the buffet, and it was a delicious spread. I brought the Spinach and Feta Quiche with Kalamata Olive Tapenade and here is a mosaic of the dishes everyone brought. After stuffing ourselves on our magnificent food, Patti Londre of Worth the Whisk led a discussion on the relationship between food bloggers and PR reps – the ethics, how to get ads, how to get sponsorship, etc. We talked about what you can and can’t do if you have a personal sponsorship when you attend a conference or event. Also what you can offer your personal sponsor. We also talked about ways to promote our blogs, such as sending out newsletters. Suz of You Can’t Eat What? We will be having a meeting in August, so if you are a food blogger who lives in Los Angeles and would like to attend, let me know. I’ll get the information to you. Note: If you are serving this as an entrée, the tart slices can be set on a bed of Tomato or Marinara Sauce of your choice. This makes a beautiful presentation and adds another dimension to the wonderful flavors. 1. To make the pastry, in a bowl, stir together the flour and salt. Add the butter and, using a pastry blender, cut it in until the mixture resembles coarse meal. 2. In a small bowl, using a fork, beat the egg with 2 tablespoons of the ice water. Make a well in the flour mixture and pour in the egg mixture and 2 more tablespoons ice water. Using the fork, mix lightly, adding more ice water as needed until the mixture holds together. Pat into a ball, wrap in plastic wrap and refrigerate for 1 hour. 4. On a floured work surface, roll out the pastry into a round about 3/8-inches thick. Transfer to an 11-inch tart pan with a removable bottom, fitting snugly into sides and bottom. Run rolling pin over top edge of tart pan and remove excess dough. There will be enough excess for another small tart. Cover the outside of the tart pan with aluminum foil, to prevent leaking in your oven. Prick the bottom in several places with a fork. Press a piece of aluminum foil, shiny side down, onto the crust, and freeze for about 30 minutes. 5. Bake the foil-lined pastry shell for 8 minutes. Remove the foil and continue baking until the crust looks dull, about 5 minutes longer. Remove from the oven, sprinkle with the Swiss cheese. 6. Reduce the oven temperature to 375 degrees F.
7. Meanwhile, make the filling: Drain the spinach and squeeze dry in paper towels. Remove any large stems and thoroughly chop the spinach. In a large sauté pan over medium heat, melt the butter with the oil. Add the yellow and green onions and garlic, and sauté until soft, about 4 minutes. 8. Add the spinach and sauté, stirring and breaking up any clumps, until completely wilted, about 3 minutes. Add the dill and pepper and continue sautéing for about 2 minutes longer. Taste and adjust the seasonings: the mixture should taste peppery. Let cool for 5-6 minutes. 9. In a bowl, whisk the eggs until blended, then whisk in the half-and-half and cream. Crumble the feta cheese into the spinach and stir in the cream mixture. Pour into the prebaked shell. It will look like there is too much filling, but it really fits perfectly. Move the solids towards the tart rim. 10. Bake until the filling is puffed and light brown and a knife inserted into the center comes out clean, 35-40 minutes. Remove from the oven and let stand for 5-10 minutes. 11. 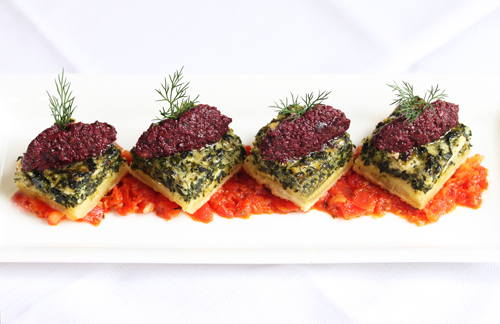 Cut into serving-size pieces and spread each with Kalamata Olive Tapenade. Serve. Pass extra tapenade in a small bowl. 1. Remove pits from olives. 2. Place all ingredients in a mini food processor and process until a paste is formed. 3. Transfer to a clean container and refrigerate until needed. Will keep three to four weeks. I have to say, that is just about the prettiest quiche I have ever seen. The layers of colors, textures, and tastes must really make it pop. I love blogger meet-ups. We all just understand each other in a way that no one else can! I wish I lived in LA…I would love to attend one of these…for both the food and the company. It was gorgeous, and it was delicious. THANK YOU Lynne for capturing the event, blogging about it and adding to the lively discussion. We learn so much from each other. Wow, as usual, your photos are stunning, and what a lovely composition of comestibles! That quiche was a foodie force to be reckoned with! I don’t know if I’ve seen a more stunning photograph. This should be on the cover of Bon Appetit next month…just beautiful. What a fun event this must have been. I only wished I lived closer! “Beautiful presentation” is an understatement! This dish is a stunner! I am bookmarking it for future events where I must cook to impress! And it looks absolutely delicious – every ingredient is a winner! That is the most beautiful quiche I have ever seen! 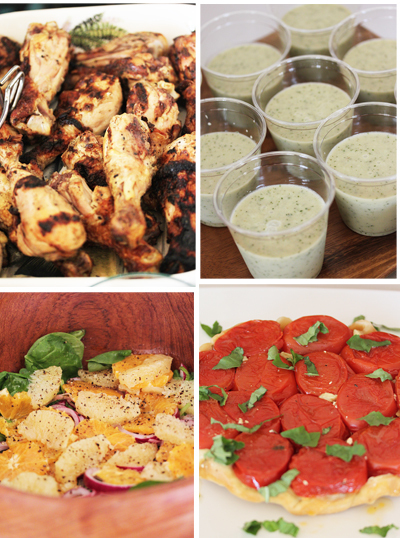 I almost want to move to LA just to attend the next blogger meeting…so I can eat the food… YUM!!! wow….you all had a feast!!! I love that Quiche you made it looks positively delicious!! Beautiful photos as always, Lynne! 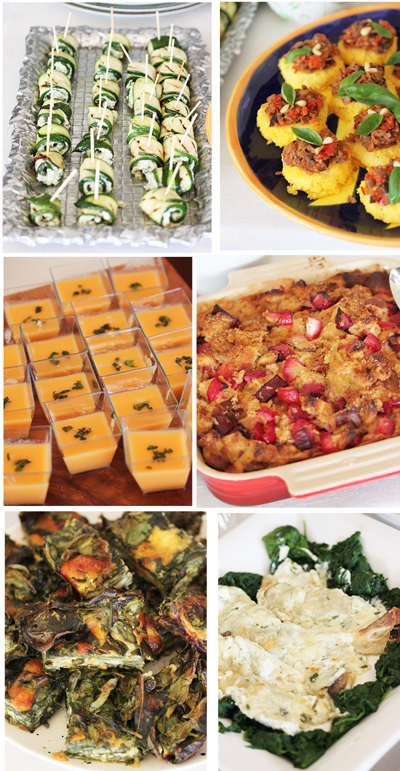 I might have to ask to borrow the photos of my zucchini rolls and plum bread pudding – yours are so much prettier than the shots I got…. Good food and great company. What a fun event! you are a true artist, whether it’s in your kitchen or behind the camera lens. Thank you for the write up, and for sharing your talents. Your photography is exquisite. How nice that you can meet and share like that. The quiche looks beyond delicious! I love your photos! Well, that is the prettiest quiche I have ever seen! What a spread! Sounds like a delicious get-together! What a feast. I just want to sit down to a big plate with one of everything. If only!! Wow this quiche is so beautiful and easy to make. It almost looks like a canape. You are so lucky to be in LA surrounded by great food bloggers and food. I love the idea of the kalamata tapenade…will be trying that! Thanks for the tip. Well this will teach me not to miss a meeting. Looks and sounds like it was a good one. That quiche looks incredible, I love all of those combinations. Definitely am bookmarking this one! 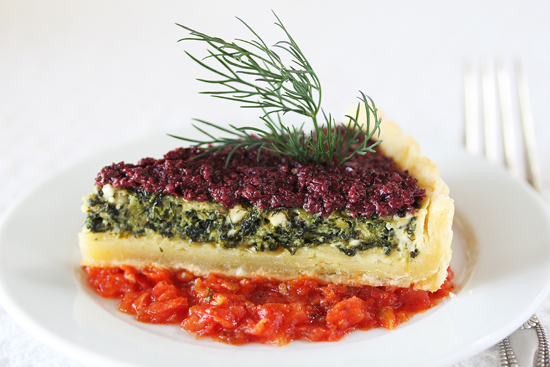 Lynne – I adore everything that’s in this quiche – great ingredients and flavors. Lovely presentation, they’re like little works of art. I’d like to join the LA Bloggers if you’re having another meeting – please let me know and I will try to be there. Gorgeous – like summer on a plate. Almost too pretty to eat. I said almost. Lynne, wow, that looks AMAZING. I envy your photography skills!! So sorry I missed the July meeting; looking forward to the August one. Hope to see you then! Oh, I love quiche. But this one looks absolutely exceptional! !